Founded by industry veterans and directed by an elite governing council, RISE Consulting Services focuses on the most crucial element which leads to the success of corporate strategy - The people factor. Having worked as top management professionals in blue chip private, PSU and multinational corporations RISE founders have analyzed the critical role learning plays within organizations, and the impact individual and group behaviour has on effectively achieving high performance. As a result, RISE has helped many organisations reach their peak performance through interactive trainings and consulting. Ajit Parmar has been a dynamic business leader driving profitable growth in businesses across industries. 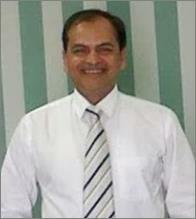 He brings vast experience in Food & Agri-business space & Management Consulting. He has over 22 years experience in renowned multinational & Indian companies such as Duncan McNeil, Harrisons, RPG, Sterling, Bharti, Avantha and NDDB group in Operations, Business Development, Supply Chain, and Corporate Strategy serving last few years in top management and as head of organizations. Ajit is a Science Graduate and an MBA from IIFM India. He has also undergone Certificate Courses in Leadership from GICL, University of Missouri, USA; and in Finance from INSEAD, France. Ajit loves to play golf, listen to music, likes travelling and reading. RISE is guided by a governing council which is a team of very eminent and distinguished corporate leaders who have worked closely with Anuradha & Ajit. They bring vast industry experience to steer RISE and help it evolve as one of the finest and most professional start-ups. Sanjay Sapra, Managing Director, Aquanomics Ltd.